Transform Yourself Today With AOK Fitness! Are you looking to improve your strength or lose some weight? Do you look in the mirror and think “I could easily improve myself?” At one point or another, we’ve all been there. 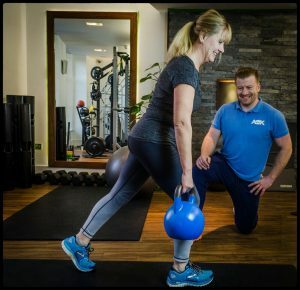 At AOK Fitness, we know what it feels like to want to make that big change you to your lifestyle, and we are here to help you make it happen. With our one-of-a-kind offers, programmes and consultation, we leave no stone unturned when it comes to exceeding your expectations. We are well positioned to help clients across Hampton, Richmond, Teddington, Twickenham and many other areas across South West London. Our programs consist of three different phases to help you achieve those results that you’re trying to get. The first phase is the consultation. We believe that the consultation is very important because it will allow us to know all the necessary information so that we can help you become the person you’ve dreamed of becoming. How is your diet? How is your sleep schedule? What are some of your other vital statistics. All of these things will aid us in finding out how we can best help you improve your health and your appearance so that you can look in a mirror and feel real proud. With this consultation, we can find out what’s been holding you back and help you break that last barrier to achieving true fitness and physical health. This phase is all about the full body screening. This will allow us to determine just what exercises are right for you. Not every person should attempt every single exercise, and we will be able to steer you towards the ones that are safest and most effective for you. This will take your specific body type and history into account, tailoring a regime that will be sure to work and avoid causing any injuries or other negative consequences. We understand that injuries and other criteria can prevent certain exercises, and we want to work to avoid this. You will receive a custom programme that is as unique as you are—just as everyone is different, so is everyone’s exercise needs. For us, it’s not about providing cookie-cutter offers, we believe in designing personalised programmes. Finally, this is the right time for you to schedule your sessions. We understand that you live in a busy world and sometimes you need to be able to call the shots. At AOK Fitness, we work around your schedule, making sure that your sessions are set up for when they are most convenient for you. We want to be able to suit your lifestyle and your needs as you work to improve yourself with our expert help. Take back control and decide how you want to live your life! Are you ready to supercharge your lifestyle? Book your phase 1 consultation today, and take your first step right now! Our programs are between six weeks and six months, and each session is one hour long. We are committed to helping you forge yourself into the ultimate version of yourself. Join us for your journey to fitness—there’s nothing left to stop you! We would be honoured to help you achieve your goals and realise your dreams as you claim that physique you’ve always wanted. That dream body is just on the horizon, waiting for you to come find it.